FORM WEDGE – ATTACK THE KING! 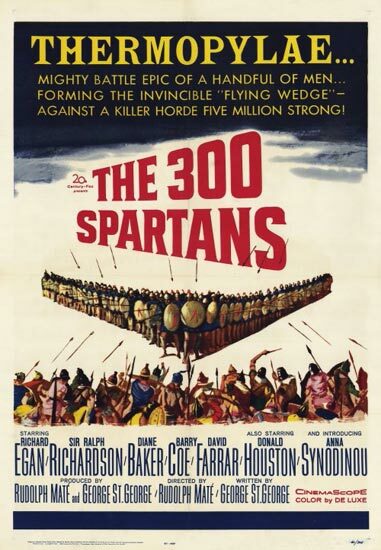 Greek warriors have always been a favorite of the publishers because of a great 1963m movie ‘300 Spartans” starring Richard Egan. We loved the helmets, shields and spears, and it fed a lifelong love of and continuing search for the best of all the gladiator movies. At the end of the film, hopelessly outnumbered, Spartan King Leonidas (Richard Egan) surmises there is nothing left to do. Then, in one of the great scenes of 60’s movies, the Spartans form their famous wedge, spears lowered to the front, and instead of retreating they drive into the vast Persian army, hacking their way toward the Persian king, Xerses – who is at first imperious on his chariot, with so many of his men between he and the feared Spartans. But the wedge doesn’t stop, and in moments it is shockingly close to the King. It is an electrifying moment when his evil grin turns to fear, but only a moment. The relentless hacking of the beehive of Persian troops closes in, their effort to defend their king renews, and in the end, the Spartans melt among their enemy; only a few are left to retreat. I always wanted toy soldiers that could represent those brave guys, but none had appeared in the United States until one fateful day at Knott’s Berry Farm (surely one of the strangest theme parks of the 60’s) around 1963 – there in a little toy store I was thrilled to discover Britain’s Herald Trojans. Here were the red capes, the tall helmeted crests, gleaming armor, the shields and spears. Very suitable shield walls formed in my mind and I decided I had to acquire as many of these perfectly great little figures as I could. The end result is Issue 56, the Britain’s Herald Trojans. No, sadly, Spartans of the type I wanted have never been made. But I am sure you will agree with the editors of Playset Magazine that these are a really thrilling bunch of figures and they came in beautifully boxed sets! But this issue doesn't stop there – the Lone Ranger returns courtesy some of the collection of the lone artist himself, Ron Lizorty, and we delve into some of the cool Fifties and Sixties toys featuring that grand avenger. It seems like his appeal is endless, and so is the line of toys featuring his likeness and name. We have selected a few for our return to the West. 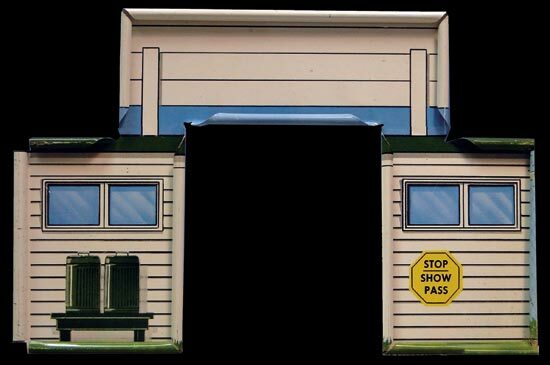 Next we have a genuine rarity – the superb Combat Center gateway and walls forming a really great entrance to any Training Center set up…. And this is pure Marx, 1958. Beautiful fresh new tin litho for our readers is sure to get the blood pulsing through your “Hunt it Down” veins! But that isn't enough for this powerful issue – we also have Fix Bayonets! - The Springfield Rifle story by George Kroll. This is a wonderful cap rifle in a store display box from the earliest 1960’s, complete with flexible bayonet. The box says it is a “training rifle” but we kids all knew that was just to assuage parental fears of this fearsome weapon…. we saw that knife and dreamt of fixing it to the front and charging other kids on the block in real GI form. 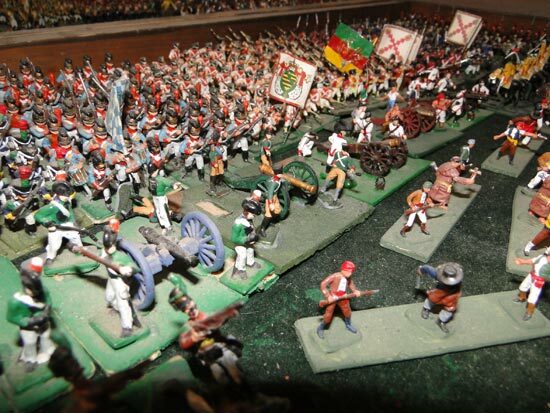 Next, you'll visit a Super Bowl Champion and his Collection – the Classic Tom Glassic shows us thousands of figures, displays, huge Western diorama and more, not to mention his movie room and a really big line up of famous game balls …… this guy and his embattled players take 3 days to play a wargame! So – did we stop there? We did not. You'll also get an update on the SAC base set, a nifty Thomas jeep, DioDrama, News (on the inventor of the 100 Soldiers in a Foot Locker, no less) our regular Puzzler, classified ads (lots of new ones to browse) our fantastic advertiser’s new product ads. You wanted it – we've got it right here on this issues fun-filled pages. 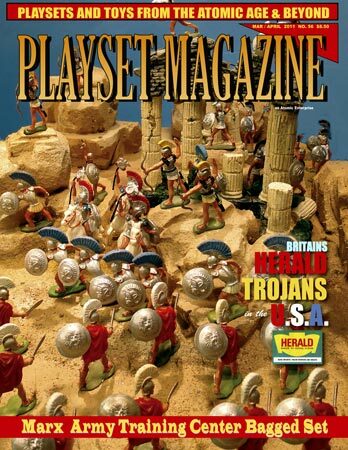 Thanks for joining us and making Playset Magazine a part of your collection!